As a mobile professional, you require versatility. So we crafted the Atlas Wheeled Backpack with flexible functionality. 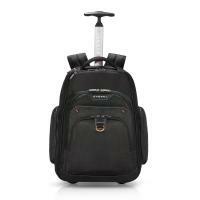 You can quickly wheel its sleek profile through the airport, or if needed, comfortably carry the Atlas as a backpack with our well-padded and extra wide straps. Got a lot of bags? Simply slip the Atlas onto another trolley handle with the discreet pass-through strap. Carrying a large laptop? Our innovative laptop pocket adjusts to snugly secure a 17.3” laptop or a slim 13” Ultrabook. If you’re not carrying a laptop this trip, take out the laptop pocket to make room in the main compartment for additional garments or gear. Taking only your tablet instead? Slip it into the super-soft felt lined tablet pocket.The Atlas – adapts to fit your diverse lifestyle. 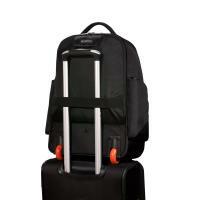 The Atlas – Everki’s wheeled backpack. 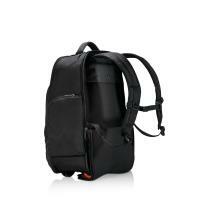 A backpack that offers flexibility as well as thoughtful functionality. Pack your mobile office in the Atlas, or use it on a weekend getaway. There’s lots of room in the spacious main compartment, an RFID protected pocket, a removable and adjustable laptop pocket and a quick-access pocket for your phone on the top of the bag. 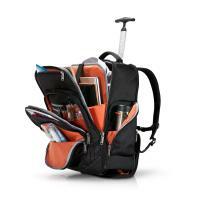 In the front you’ll find see-through mesh pockets, slots for pens and peripherals, and a designated hook for your keys. 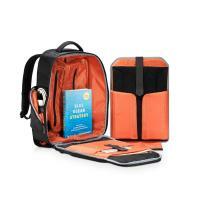 A space for your tablet, water bottle, wallet and magazines are all intuitively placed in the Atlas. And all of these features are handsomely accented by our high contrast orange interior. The Atlas. Versatility on wheels. Laptops come in many sizes. 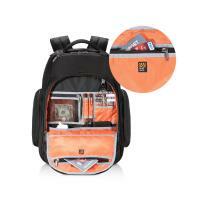 That’s why we designed the innovative laptop pocket to fit a wide variety of laptops. Our fully padded laptop pocket adapts to snugly secure a slim 13” Ultrabook or a large 17.3” rugged laptop; or you can remove it completely for even more space in the main compartment. Customize the size of the pocket from the bottom and both sides, and use the Velcro strap to secure your device from the top. Carrying your tablet also? The Atlas has a place for that as well. The easy access iPad/Kindle/ tablet pocket is lined with super-soft felt to protect from nicks and scratches. Most contemporary passports, credit cards and smart cards come equipped with an RFID micro-chip. Carrying them may make you vulnerable to illegal remote scans of the personal information stored on them. Identity theft is a serious concern. So we designed the Atlas to protect the sensitive data on your passport and credit cards with an RFID-protected pocket. Simply slip your passport, credit cards or other forms of identification into the secure pocket, and your personal and banking information are safe from illegal RFID scans. We’ve engineered the Atlas with sturdy, large wheels that are inset into the bag for a smooth, quiet ride through the airport or into the office. When you can’t roll your bag, use the extra-wide, padded straps to carry the Atlas as a backpack. The weight distributing chest strap balances the load front to back, and the straps won’t dig into your shoulders when the pack is loaded. The backpack straps are neatly zipped away in the back flap when they’re not in use, and the same flap covers the wheels and protects your clothes when you’re carrying it as a backpack. Discreet, quiet comfort. When you’re traveling with many bags, the trolley handle pass-through on the back of the Atlas allows you to double your efforts. 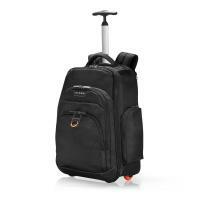 Simply compress the telescoping trolley handle and slip the Atlas onto the handle of your roller luggage. and how difficult it is to organize against a black background. Savvy and Stylish.